The reason is simple. James Lawrence Isherwood hated anything which smaked of censorship. He was a liberal minded man and thought that adults should be able to do as they liked – within legal limits. 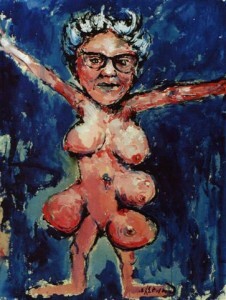 His Mary Whitehouse portraits caused a riot…especially when the Director General of the BBC, Sir Hugh Carlton Green, bought one because, being pestered round the clock by Mary Whitehouse, he told the papers he wanted something he could throw darts at. Good story and Isherwood wallowed in the publicity. He had, of course, painted other daft, gimmicky portraits of celebrities he’d taken a sudden dislike to (see separate feature on gimmicks on this site). But his one of Mrs Whitehouse with five breasts was the artist at his most cruel.